Game description: Follow the path of the Samurai Warriors through all new tales in Story, Free, and Survival modes. Team up with friends for 2-player Co-op play or challenge them at Sugoroku, a bonus party game for up to 4 players. Plus unlock over 70 bold cinematic visions of Japan's Samurai history! 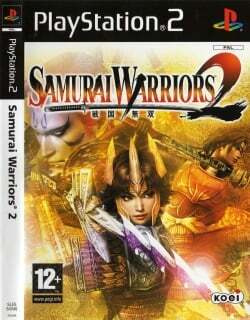 Second game in the Samurai Warriors series, the gameplay of Samurai Warriors 2 builds on the first by adding new characters and new features, such as the removal of the traditional range attacks in favor of the addition of two unique special abilities that differ from character to character and a Sugoroku mini-game. Europe v01.70(27/02/2003), Recommended,MTVU, Works great, some slowdowns when around huge enemy crowds (even the PS2 console had those), 'True Musou' attacks make the emulator get stuck on a black screen, making the game unplayable after you get the 'Awakening 2' skill with any player or use a musou attack when near death. USA v02.20(10/02/2006), completed, light game for any cpu/gpu. This page was last edited on 19 November 2016, at 17:02.